This article was originally published by CityLab and is reproduced here as part of the Climate Desk collaboration. When the ground starts shaking, Rick Wallace has three things to do: check on his wife and house, find his emergency stashes of food and water, and get to work. As the manager of the Emergency Operation Center (EOC) on Washington state’s Vashon Island, it’s up to him to get the emergency operation team in motion when “the big one” hits the Pacific Northwest. That means jumping on his ham radio and instructing each volunteer member in the community to go to EOC headquarters (a large space at the main fire station) and report to the Island Incident Commander (normally the fire chief). 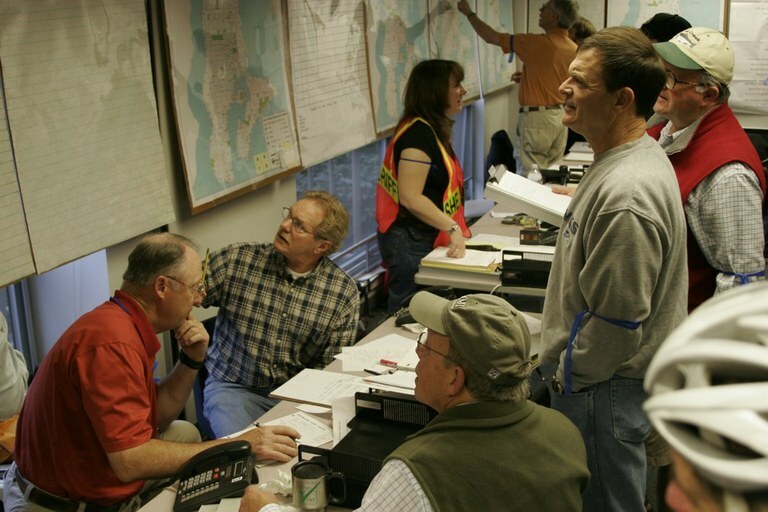 Vashon Island residents work in their Emergency Operations Center to discuss how to respond should a major earthquake take place. These plans are just the start of what would surely be a challenging time for the region, and for the island community specifically. They’re also seen as crucial to getting recovery efforts off on the right foot for a community that’s close to a major urban area, but could suddenly feel a world away when disaster strikes. Vashon Island, like nearby Seattle and Tacoma, lies along the 700-mile fault line known as the Cascadia Subduction Zone, which runs from Vancouver Island, Canada, down to Northern California. Its last major rupture is believed to have happened in 1700, and The New Yorker reported in 2015 that its next full-scale quake could trigger “the worst natural disaster in the history of North America.” That Pulitzer Prize-winning story documented just how unprepared the region and country are for “the really big one.” Vashon Island, nested in Puget Sound, is also exposed to other major fault lines, including the Seattle Fault, just a few miles north, and the Tacoma Fault, which runs through the center of Vashon. For the community there, that’s all the more reason to prepare for its own needs after a devastating quake. Unlike many of their neighboring communities, the residents of this picturesque island 17 miles southwest of Seattle don’t have the luxury of relying on outside help in an emergency. Known for its idyllic beaches, lush forests, and century-old Strawberry Festival, the island is one of two in King County, Washington, that doesn’t have a single road connecting it to the mainland. It also doesn’t have a hospital. As Wallace sets up the command post, the emergency response effort is set to kick into gear across the island. The local public radio station, Voice of Vashon, will send out emergency alerts, letting residents know what has happened and asking them to stay off the roads if possible. Members of the Community Emergency Response Team (CERT), local volunteers who have been trained in emergency operations, will set up command posts at Vashon’s other fire stations, and go out in teams of two to take stock of 100 critical locations, including gas stations and schools. And Vashon Fire and Rescue officials will set objectives and establish a field treatment site to care for the injured. All told, the response work may involve as many as 200 volunteers working alongside emergency officials. Wallace expects it will take just a few hours for emergency response leaders to know what kind of destruction an earthquake has caused, and what they’ll have to do to keep everyone safe. 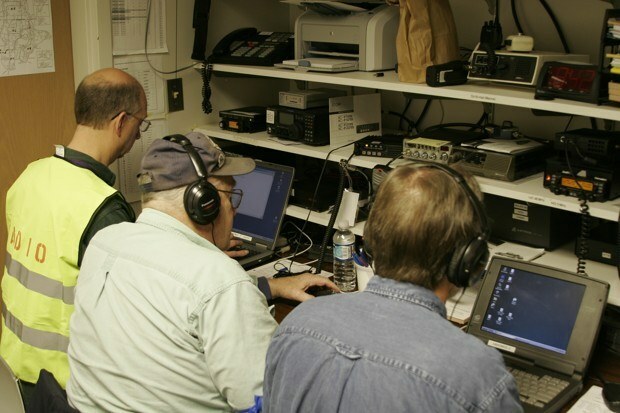 Ham radio operators in the emergency operations center radio room. It’s difficult to predict exactly how major quakes would affect the island, but Wallace says they could potentially knock out 25 percent of the housing stock, seriously injure dozens of people, and take down natural gas lines and the sewer system. The ferries might not be working, and helicopters might not be readily accessible. Chances are good that any outside emergency help will be focused, at least at first, on the millions needing aid in Seattle, rather than the nearly 11,000 on Vashon. So for the first few hours or days, what they “got” may be strictly limited to what’s on the island. The island’s separation from Seattle and its rural landscape has certainly had a physical impact on the community, but it’s also had a psychological one, says Vicky de Monterey Richoux, a Vashon resident helping to lead disaster preparedness. There is a strong island identity among residents, resulting in a close-knit community where people regularly depend on one another for everything from tools to dealing with downed deer. “We have classic rural problems and classic rural solutions that bring people together on a regular basis,” she says. In fact, the island community has been building up its emergency preparedness efforts for nearly two decades. The work was initially kicked off when Joseph Ulatoski, a retired brigadier general and island resident, started asking who was responsible if a disaster struck. His questions led to a small group of locals meeting monthly to figure out exactly how they would handle such a situation, Wallace says. “As time went on, it became clear that we needed to be more organized, structured, and also that we would be in a form that could be recognized by people,” he says. The result was VashonBePrepared. Today it’s a nonprofit, FEMA-sanctioned coalition of the island’s disaster preparedness organizations, including CERT and Voice of Vashon. Its purpose is exclusively to prepare the island for an emergency by helping to coordinate these organizations; it doesn’t actually play a role in real-time response efforts. “It is a coalition to organize these partner groups to be efficient, avoid redundancy and duplication of effort, and inspire each other to move forward with all these different programs that each of us are running,” says Wallace, who is also the vice president of VashonBePrepared’s executive committee. One of these key partner organizations is the Neighborhood Emergency Response Organization. Similar, in a sense, to neighborhood watch groups, its leaders have organized hundreds of households into neighborhood groups so they can get to know each other and thus be more likely to help one another if an emergency hits. “The first people historically to help each other after an incident are neighbors and friends who are right there on the spot, because often the professional responders are overwhelmed and can’t necessarily reach people,” says Richoux, who is the president of VashonBePrepared’s executive committee. Although the EOC has been used in the past to respond to extreme weather, the island has yet to set its full emergency response plan into action. But all of the groups on the island do regularly conduct drills to make sure they are ready. 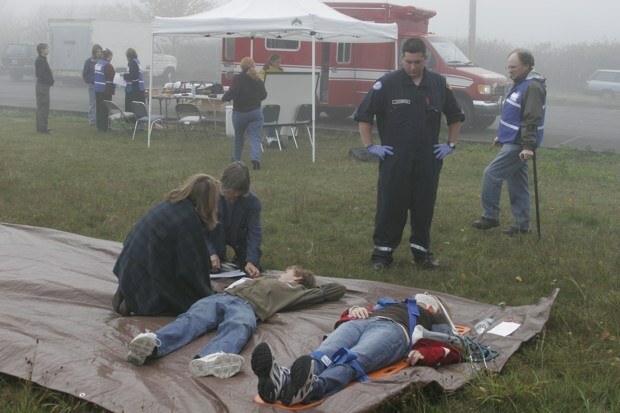 Volunteers participate in a disaster drill on foggy day. Between these drills, its many emergency organizations and its hundreds of active volunteers and emergency officials, Vashon has become a shining example for the rest of the Pacific Northwest in how a community can look inward to prepare for the worst. But that doesn’t mean the island is perfectly prepared. “We always say, ‘If we’re so prepared, god save everybody else,’ because we don’t think of ourselves as being overprepared,” Wallace says. Hallie Golden is a freelance journalist based in Seattle. Her work has appeared in The Economist, The New York Times, and the Associated Press. Email High Country News at [email protected] or submit a letter to the editor.